A strange and mysterious disease is going around and only two physicians are willing to treat it. One of them is a lonesome Chinese acupuncturist; the other a certain western doctor. No one knows which of these two physicians is better, so patients flock to them basically at random. 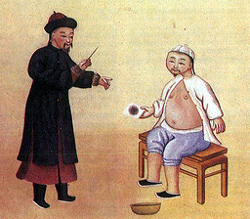 The western doctor tends to cure 80% of men and 20% of women that are inflicted with the disease, whereas the Chinese acupuncturist tends to cure just 75% of men and 10% of women. So the western doctor seems to be better. But, at second glance, the Chinese acupuncturist tends to cure 53% of all his patients, whereas the western doctor tends to cure only 40% of his. So the Chinese acupuncturist now seems to be better. Named after Edward H. Simpson, who drew wide attention to this “paradox” in the 1950s.